This was a residential (Class 2 | Cat 1) water loss. The loss was created by a hot water PEX pipe failure located in the kitchen wall. The Kitchen and, Living Room and Small Dining Area. The policyholder was away on holiday, and the hot water line turned the property into a sauna of sorts for ~4 days prior to the Policyholder coming home on Sunday and finding the downstairs underwater. Much of the contents was covered in visible microbial growth, it was unclear at first glance what contents remained salvageable vs. total loss, but those determinations would have to be made off-site, pragmatically in the days and weeks to come. In the immediate term, the place had to be packed out, as the dry down needed to take place immediately to mitigate additional damage to the property. i.e., the mitigation contractor could not deploy his equipment until the affected areas were packed out. As soon as the EMS packout contractor was engaged they reached out to an emergency response storage outfit, and they commissioned an after-hours drop of a 16′ container that very Sunday. Due to the fact that the contents displayed elevated moisture, accompanied by a strong musty odor, the Packout Contractor called for a Concrobium odor control desiccant pack to be deployed within the container – the emergency response storage outfit was happy to oblige. Due to the urgent nature of the loss, the packout contractor worked through the night in an effort to packout the affected contents. In an effort to accommodate the stringent HOA regulations, the container was picked up on Monday at 8 in the morning (heavy) and hauled back to the climate controlled facility for 2 months of off-site storage. Contents restoration and textile restoration reside beyond the scope of this Insight Sheet. 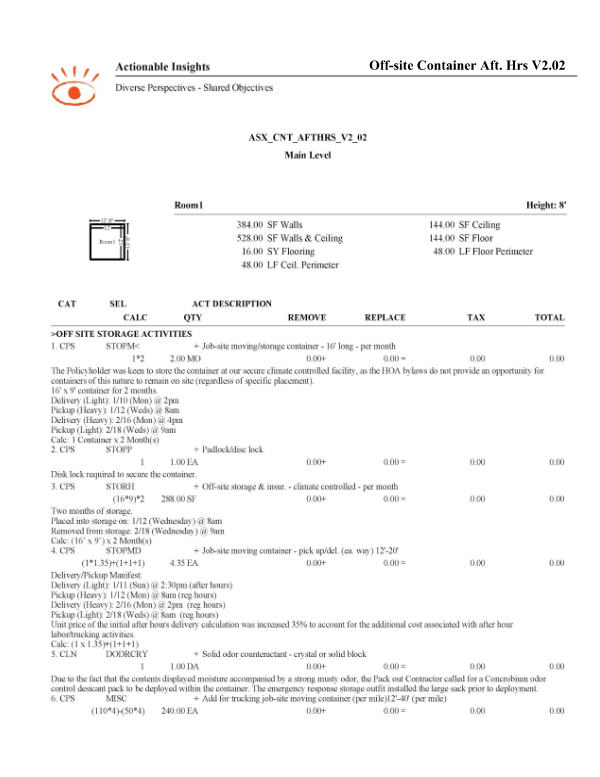 This Insight Sheet exists to clarify how one might invoice for an off-site storage container with decontamination. This does not seek to include or make concessions for all equipment and/or activities as it relates to a loss of this nature.